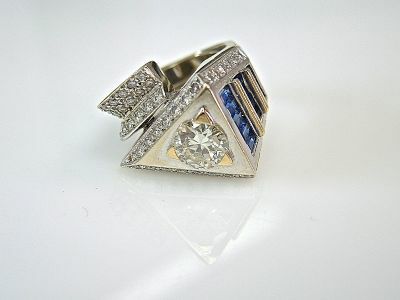 A stunning Art Deco inspired custom made 18kt white gold ring, circa 1990's, with a distinctive triangular top that has 1 old european cut diamond, est. 1.86ct (clarity: VS2 & colour: I-J); 70 round brilliant cut diamonds, est. 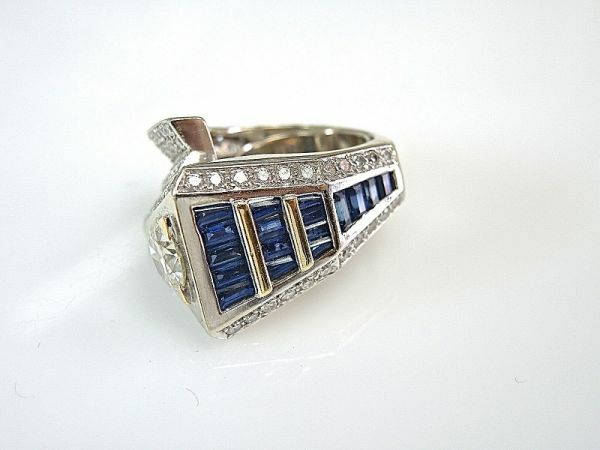 1.59ct (clarity: VS & colour: F-G) and 17 straight and tapered baguette blue sapphires, est. 2.46ct. (clarity: LI & colour: deep blue).